1. The food is seasoned just right. The taste is perfect and there are several options to choose from. 4. Great customer service - they have accommodated any special requests I have made, and with a smile. This was my first time to Fasika. I had been craving Ethiopian food for a while so was delighted to see the food truck. I went around 11:30 when it first began serving food so there was really no line. The customer service was excellent. The man at the window recommended a few items, and I decided to go with the meat combo with key wat, lentils, and gomen (collards). 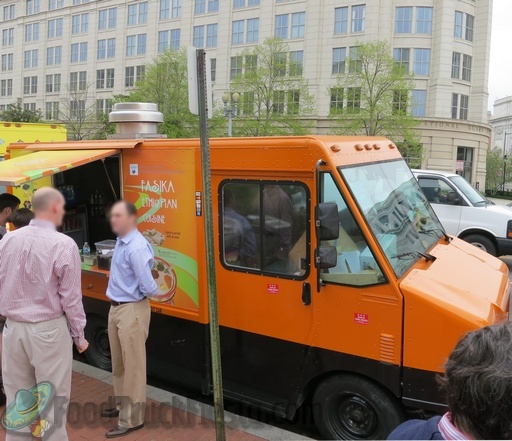 It was the quickest service I have ever had with a food truck (granted, there was no line). I also got a bottle of cold water with my meal. The food was absolutely delicious and the portion was huge! For $10, I felt like this meal could feed 2 or more. I will definitely be going by there again! Veggie combo was delicious and filling. A bit pricey, but I ate it for lunch and as a snack since it was so plentiful. One of the items was a bit spicy for me, but mixed with the others was great. Given the weight and oil content, I'd recommend sturdier boxes. Otherwise, delicious and I'd go back! Also very friendly. $10 for a veggie platter is a bit more than the competing Ethiopian trucks, but the portions are generous and the price includes four dishes plus soda or water. It's a very filling meal (or 2 meals). My only small criticism is that the red lentils were not spicy at all, vs Lilypad's which are excellent. Otherwise though, it is a very decent food truck. First, let me start by saying that their customer service is wonderful--the lady that helped me will remember me because I owed them $10 dollars from the visit before due to their credit card machine not working--So I went by there to do the right thing, pay back what I owed and perhaps get my favorite (Lamb Tibs) which they did not have. She tried to stear me in the direction of the Beef stew however I decided to get the Beef Tibs. Much to my chagrin the Beef was very very dry, hard, there was no sauce in the tibs. While I was waiting (by the way--too long for me) I noticed she was using a very scratchy teflon pan which sends out a huge red flag for me--but it was too late, for I had paid w/my credit card and just stood there bearing it, knowing that it really bothered me. Normally I would fuss and sensor any kind of in my perception wrong-doing, but I did not want to because others were waiting behind me. The nice lady said enjoy your lunch so cordially w/a smile and I thought to myself "somehoew I hope so". Well, you can guess the rest. I did not enjoy my meal at all and will not be back except to check with them to see If they are using stainless or cast iron skillets--that's the only way they will ever get any future business from me. I must also add that I threw all but some of the injera and veggies that went with away-- i love dancing however,my stomachs now doing a dance--and it is not a happy one. I hate to have to report this but how else can they possibly make improvements. Fasika! Step into the 21st century and stop using Teflon which is extremely carcinogenic all by itself, but a scratchy pan--really dangerous and I could spank myself for eating any it so I take responsibility for that. My rationale for doing so is that there are too many starving people in the world and food should not be wasted--I had to throw most of it away though! Not happy with the food I received--You should take responsiblity as well :/ Beware all others...Learned my lesson for the last time about Teflon--I could taste it! Never again. The food is good, spicy lentils, sour-ish injira, potatoes in the collard greens, which is a nice variation. It is, however, more expensive than Lilypad on the Run. My first time at the Fasika truck but it won't be the last. The veggies were cooked and seasoned to perfection. You have a new, very loyal customer. And BTW, they do have their prices on the truck. AMAZING food! They were super friendly. I was able to mix and match my favorite meat and veggie dishes. Very accommodating, and they take credit card. AMAZING food! They were super friendly. I was able to mix and match my favorite meat and veggie dishes. Very accommodating, and they take credit card. This is BY FAR my favorite Ethiopian food truck. Excellent food and very clean. Great service. She cooks custom order the way I like it right there. Yummy! Fasika Ethiopia Cuisine serves Ethiopian fare for both meat and veggie lovers. They launched in November of 2012. 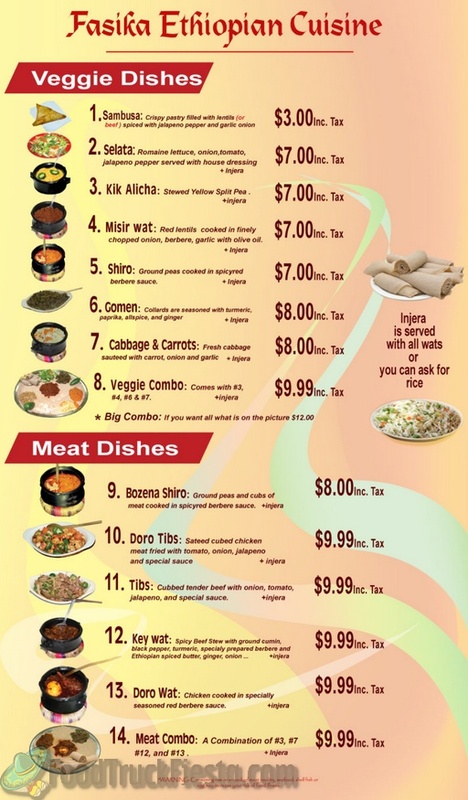 Menu, courtesy of Fasika Ethiopia – thanks!